As SFS approaches its Centennial Celebration in 2019, we are excited to host the first annual Spring Fest | SFS to bring together our community and celebrate the global arts and engagement! 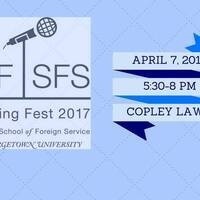 We'll have FREE SF | SFS t-shirts, pizza, and BBQ! This event is open to the whole Georgetown community, so please invite your friends, family, and professors to join!